Today is the anniversary of my mom's death...I guess it was almost 20 years ago today? I was thinking of her and trying to think of a suitable blog post to pay tribute to her on this beautiful (sunny?!) May morning. 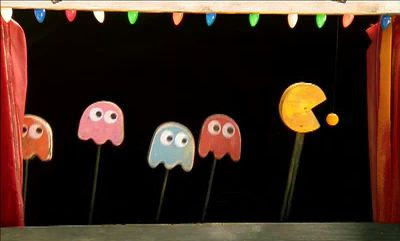 I thought maybe I could post a photo of her favorite flowers, or maybe a link to a song she liked, but instead I've decided to talk about...a Pacman puppet show! Let me explain. So, we had these fuzzy Pacman finger puppets (the above photo doesn't cut it, but it's the best I could find) that we got for Christmas one year. And I don't know how it started, but my mom would put on these puppet shows for my brother and me in which the plot was always the same. Each ghost would introduce himself and state his name, "My name is Inky, my name is Blinky, etc., but when she got to Clyde, he would bewilderedly pause, forgetting his name, and then yell, "so my name must be Stinky!" and all the other ghosts would shake their heads and say, "NO, NO, NO" and pandemonium would erupt and my brother and I would grab our toes and literally roar with laughter. And this never got old--we would ask her to put it on again and again. And that is how I would like to remember my mom today. Someone with infinite patience, warmth and kindness as well as a penchant for silliness (not to mention impeccable comedic timing!) which I can only hope to emulate someday. She probably would be surprised that a Pacman puppet show is one of my fondest memories of her, but I think even a small, loving gesture can have a lasting impact on someone's life. So remember that. Go forth and be love. What are you waiting for? Aw, O. This was really sweet. Everybody else better call their moms after reading that. great stuff, kid. your honesty & love are a credit to our species. hope the sun's shining on ya.